This is the second of two posts on 20th-century Muslim heritage in Indianapolis that come to us from Millennium Chair of the Liberal Arts and Professor of Religious Studies at the Indiana University School of Liberal Arts at IUPUI, Edward E. Curtis IV. Click on Indianapolis’ Homegrown Islam: The Moorish Science Temple of America for the first post. 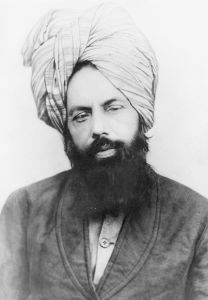 Mirzā Ghulām Ahmad (1835-1908), the founder of the Ahmadiyya Movement in Islam (click on image for expanded view).